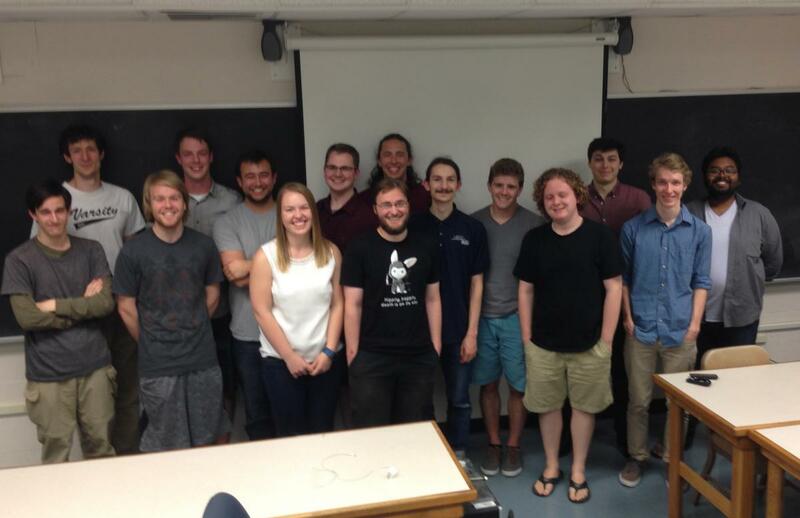 PH403 THESIS, The writing-intensive course (WIC) for physics majors. Possible Projects for 2018/2019 are at this link. PowerPoint slides from the Senior Thesis presentation on 19 October 2018. Overview: All Physics majors are required to complete a senior thesis. The thesis can be based on experimental work in a laboratory, computational work using workstations or supercomputers, or theoretical work with paper and pencil. The ability to conduct research and to disseminate the results is the hallmark of a scientist. Research results need validation, so they are shared with the community to be criticized, verified, and expanded upon. The written form is the most important because it is a permanent record, and allows other researchers to carefully examine the details of the work. It is therefore our philosophy to connect the senior research project and thesis with the University’s WIC requirement. Each year, a WIC Culture of Writing award is made. The senior thesis also serves to fulfill the Honors College thesis requirement, and the "Undergraduate Research Fellow" transcript notation. Students participate in a departmental mini-conference at the end of spring term to give oral presentations of their work. Junior year: Research projects underway, attend informational presentation in Paradigms class on last Thursday of fall term (Th 12-2 pm in Weniger 304), attend senior presentations at the mini-conference in finals week of Spring term. Senior year (or final year of 5-year program): Continue research, enroll in PH403 for 1 unit in each of Fall, Winter, Spring. Complete thesis, give oral presentation in finals week of spring term. Research: Research projects are usually under the supervision of a Physics Department faculty member, but physics-related research projects with faculty supervisors from other departments are common. In either case, register for PH401 (Research). Off-campus internships or REU projects (Research Experience for Undergraduates) are excellent avenues for conducting research. If you exercise this option, you must discuss it with the PH403 instructor before you go. It is important that the off-campus mentor agrees ahead of time that the project is of appropriate scope and is willing to keep in contact through the year. We must also arrange to have an OSU faculty member be a local mentor. Students should begin their research early, using freshman and sophomore years to explore research opportunities. Visit faculty members in their offices, browse their websites, talk to other students in the department, look at lists of former projects, attend presentations in the department to find out what type of research would be interesting to you. Find out about internships and summer research opportunities on and off campus. Organize meetings through SPS to educate yourselves about possibilities, invite faculty to speak about their work. You will gain the most from your research experience if it is sustained over a longer period, but you should plan to be working on a project no later than the winter of your junior year. The physics major program is currently in transition to a requirement of 3 units of PH401 (Research) for students entering in Spring 2017 and later. Previously, research projects had to be done, but students were not required to register for PH401. In the new mode, other courses have been removed from the major and replaced with required PH401 to make time for research. You may continue to work in a research lab, with your advisor's consent, after you have completed the required PH401 credits. A typical timeline for PH401 is 1 unit in the Spring of the Junior year and 1 unit in each of Fall and Winter of the Senior year. Thesis: PH403 (Thesis) concerns the writing aspect of the research, and students enroll in 1 unit of PH403 in each of Fall, Winter and Spring of the senior year. You will need permission from the Physics office to register. These three total credits satisfy the OSU Writing Intensive Course (WIC) requirement of the OSU Baccalaureate Core requirement. (Engineering Physics majors satisfy the WIC requirement through their approved senior design project in their specific field of study in the College of Engineering). Students meet weekly as a group to write, critique, and revise their writing. They also discuss and write about issues relating to ethics, types of science writing, and logical presentation of ideas. In Winter and Spring, activities focus on the thesis itself, including significant time devoted to the writing and revision of the thesis. Steady progress and continual peer and advisor review are expected throughout. A typical thesis is about fifteen to twenty pages, or about 3,000 to 5,000 words. The goal is to have the thesis ready by week 6 of Spring term. This means that research should be substantially complete by the end of Winter term of the senior year. Mini-Conference: After the written thesis is complete, class time is devoted to preparing 10-minute oral presentations, the standard at physics conferences. In the final week of Spring term, there is a mini-conference where students give oral presentations on their projects to the department. Questions? Talk to the PH403 instructor or head advisor. Scroll to the end of the page for answers to common questions about the WIC and the senior thesis. David Konyndyk Design of an Optical Medium for the Simulation of Neutron Transport in Reactor Component Materials Klein, Nuc. Engr. Colin Shear (Honors College) Thin Film Bi-based Perovskites for High Energy Density Capacitor Applications Gibbons, Mat. Sci. Michael Joyer (Honors College) Deformation Reduction in Intermetallic NiAl Microlaminations Warnes, Mat. Sci. Browse the department's research page to find out what the faculty do. Look at the current projects listed under the link at teh top of this page. Look at the thesis topics of previous students. Approach professors and ask them if they have a project for you. If you are uncertain about how to do this, ask a senior students, a professor from whom you have taken a class, or the PH403 instructor. The sooner, the better! The research for your senior thesis should begin ahead of the start of the WIC, in the spring or summer of the academic year before the WIC, and absolutely no later than the first day of the fall quarter for graduation in the spring of that year. Should research be completed before the WIC? No, most students have been working for a term or two, or a summer when they start the WIC, but still have work to do to get results. If you start research in the Fall in which you begin the WIC, you will have to devote a considerable amount of time to research in that term. Some students who have participated in an REU or internship or who have been working in a lab for more than a year may have completed their research by the time they start the WIC. Do I sign up for PH401 (Research) or PH403 (Thesis)? PH403 and PH401 are different. PH403 is the writing course that is offered to the entire senior cohort for 1 unit each in Fall, Winter & Spring (1 unit each). Do not register for PH403 for any other reason. The purpose of PH403 is help write the thesis associated with the research you conduct by taking PH401 or by conducting research off-campus in an approved program. The physics major program is currently (2017) in transition to a requirement of 3 units of PH401 (Research) for students entering in Spring 2017 and later. (Previously, research projects had to be done, but students were not required to register for PH401.) If you conduct off-campus research, you must discuss a waiver with the head advisor. If you conduct undergraduate research at OSU as an undergraduate, even for purposes other than the senior thesis, it is good practice to register for PH401 (Research). If I plan to stay a fifth year, when should I take the WIC? You can take the WIC in the 4th or 5th year. Choose the year in which you can devote the most attention to your thesis. Your research should begin ahead of the term in which you begin the WIC. If I plan to graduate mid-year, when should I take the WIC? You should take the WIC in the last full academic year that you are at OSU. If I decide to delay graduation after starting the WIC, should I continue to take the WIC? Talk to the PH403 course instructor and the research advisor about details. Most students who chose such a delay continue to take the WIC and work on research. They write a good basis for the thesis, and receive an incomplete for the course in the Spring. That "I" grade is removed when they turn in the final thesis. If I forget to take PH403 in the Fall, can I still take it in Winter and Spring and graduate in the Spring? As in most of life, exceptions may be possible if you are responsible, professional and plan ahead. You will need to present an alternative plan that will fulfill all the university requirements for the WIC. We have had very few exceptions to the rule. If there are serious unforeseen circumstances, please discuss them with us at the earliest possible opportunity. Who is "us", i.e. to whom should I talk if I have questions?